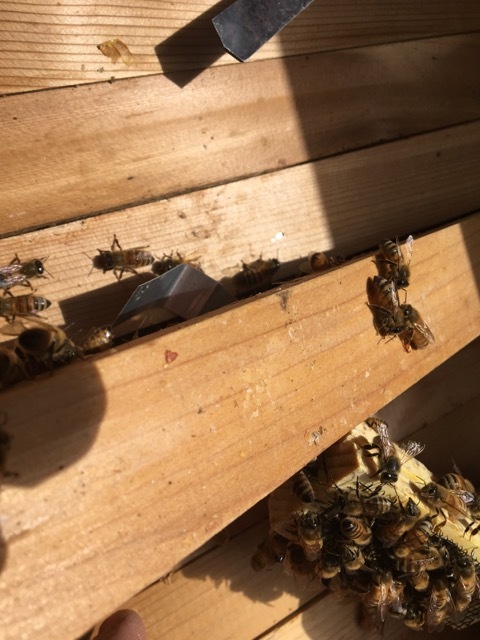 Three days had passed since I had installed the bees into their hives. 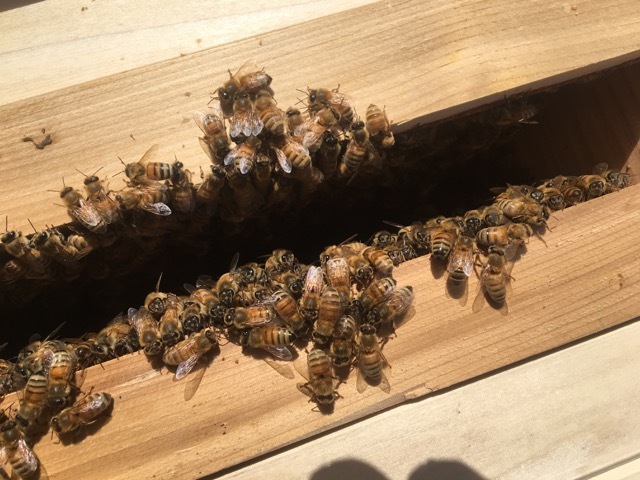 It was Friday and the weather was a little on the cool side, but I was eager to check in on the queens. The temperature was in the 50’s and it was sunny out. The goal for the day was to make sure that the bees had accepted and released their queens from the queen cages. The Meadow Hive was the first stop. The bees were out flying and exploring their new environment. When I opened the observation window, the bees were mostly hanging on the two bars that had comb and on the empty bar in between them. The feeders were still full, the bees have not been eating the syrup. I lifted one of the jars of syrup and sprinkled it around the feeder area to try to attract the bees. Then I put the jar back onto the feeder base for the bees to be able to access it. After closing up the feeder area, I opened the nest area to check the queen cage. 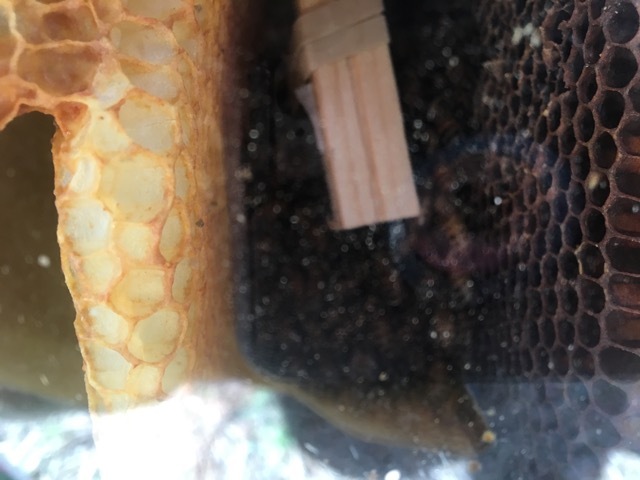 The queen had not been released, so I took the other cork out of the queen cage and put the cage back into the hive. The bees were calm the entire time I was disturbing them. Since the bees were so calm I think that things must be going well with them. Usually if things are not going well, the bees with not be happy or easy to work with. My next stop was Old Frog Pond farm and first up was the Willow Hive. There were lost of bees out flying around. When I opened the hive, I checked on the feeders. The bees are not taking the syrup, but there were bars with honey in the hive. The bees prefer the honey to the syrup and I agree with them. 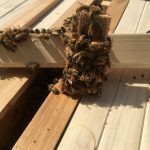 I took out the bar that the queen cage was hanging on to check on her and they had built comb all around the queen cage already. This was an empty bar three days ago. Once I was able to get the queen cage out of the wax, I checked for the queen. She had already been released. 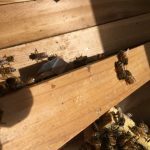 The bees were so easy to work to with and I was able to put the bar back with no issues after removing the queen cage. Everything looked really good and the bees were very peaceful. The next stop was the Orchard Hive. When I got this hive, I watched the bees flying. It’s easier to watch this colony since their hive opening isn’t directly over the pond. There was a lot of activity and the bees were very pleasant. 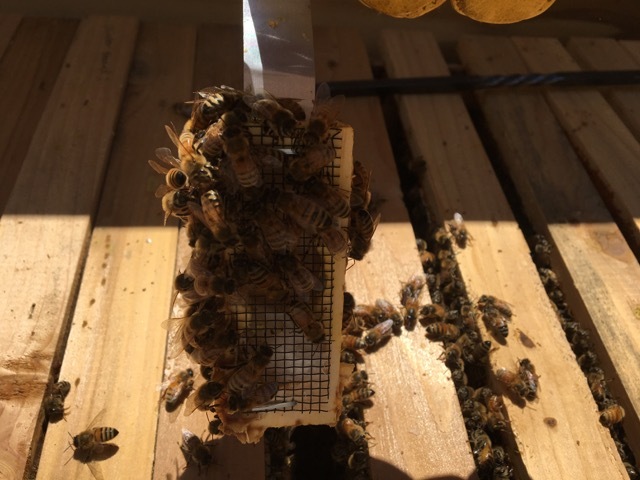 This colony has bars with honey also and they are not eating the syrup that I put into the hive. I am hoping that this means that I won’t need to feed them very much this spring and they will find better food that the syrup. It’s so much better if they can fill their hive with nectar than syrup. 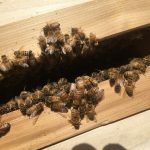 These bees had not released the queen yet and they had built comb around the queen cage. I cut the cage out of the comb and removed the other cork. 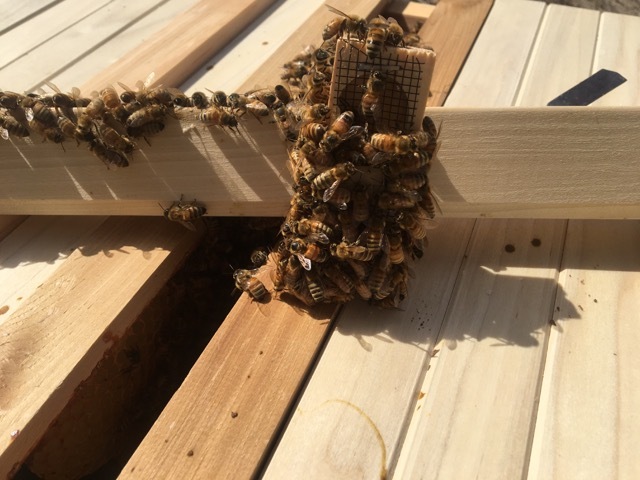 This time I turned the cage so that the queen could walk out into the hive. That is exactly what she did. It was really fun to watch her just walk into the hive. 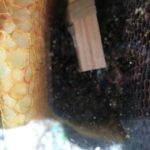 This also allowed me to remove the queen cage from the hive since they were building comb around it. This colony was also very easy to work with, the bees were so gentle and happy. Now for the Healing Garden Hive. For the fourth time, I found that the bees were not eating the syrup. This colony has bars with honey too, so I am not concerned. 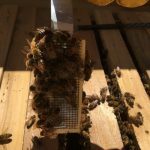 This colony had released their queen and it was easy to get the queen cage out since they had not built comb all around it. This colony was the fourth one of the day that was so pleasant and easy to work with. It made everything so enjoyable today to work with happy, easy going bees. The next day I went back to the Meadow Hive. The bees still had not found the feeders. This time I opened the feeder area and took out the divider board. Again I took out a jar of syrup and shook it around the feeder area. Several bees found the drops of syrup and were drinking them up. After showing them where their food is, I checked in on the queen. Today she was out of the cage and I was able to remove the queen cage from the hive. The Meadow Hive does not have a water source close by like all of my other hives do, so I needed to find a way to provide some water for them. At this point, I have a simple plan for giving them water. I went to the feed store and found waterers for chicks that I can use glass Mason jars with. I bought two of them to put near the hive. The down side of this is that they are only quart jars and I am sure that in the summer I will need to replace them every day. It might be a good idea for me to look for another solution, but for now this will have to work. The meadow has full sun most of the day which made it a bit challenging to find places to put the waterers. Right now, there is one on each side under the hive. Two years ago I had put a waterer out in my front yard. It was one of those dog water bowls with the large water tank on the top. I had set it on a small table to keep it off the ground. The problem was that the sun shining through the water jug began to melt the siding on my house. Since the hive legs are made out of wood, I didn’t want to accidentally cause a fire. When I first put one of the waterers near the hive it seemed to have the same effect, like when kids used to burn ants with a magnifying glass. Needless to say, I moved the jars to make sure that they couldn’t have this effect on the hive. For now, I will just check the jars every few days until I find something better. In a few days I will be back out to the hives for a more in depth inspection to make sure the queens are in there and laying eggs. Hi, This is Diane Lavery( Mother if Monarchs) Have you heard of a puddler? I plan on making one for my garden so the bees and butterflies have a place to rest and drink. I think this would be a great addition to the meadow. Hi Diane – That would be lovely! Thank you 🙂 And thank you for checking out my blog!